The network backup disk does not support the required AFP features. It turnes out that during the upgrade to Lion Apple used their newest set of commands that were not compatible with stable netatalk package in Ubuntu. To get my network storage to work again I had to upgrade to the latest netatalk 2.2.beta4. I’ve chosen to keep old version of configuration files, the only notable difference was that now afpd.conf lists -tcp -noddp options as defaults. I added them to my list. Quick restart of netatalk daemon and voila – Time Machine works again. I am a fan of Apple’s Time Machine backup system since it’s introduction. And I’ve always wanted to implement something similar on my server. Since I have that nice spacious NAS disk right now space stopped to be a problem (at least for a little while). Little googling shows that rsync has a special option allowing me to implement Time Machine’s method of incremental backups using rsync. In that method rsync uses existing backup as additional source for comparing files and if file did not change since last backup has been done a hard link is being created to this file instead of copying. This way I should end up with daily directories of files but only new/changed files will be eating up disk space. All parts are here, time to do some work. My main goal was small initial cost as well as small footprint if at all possible. 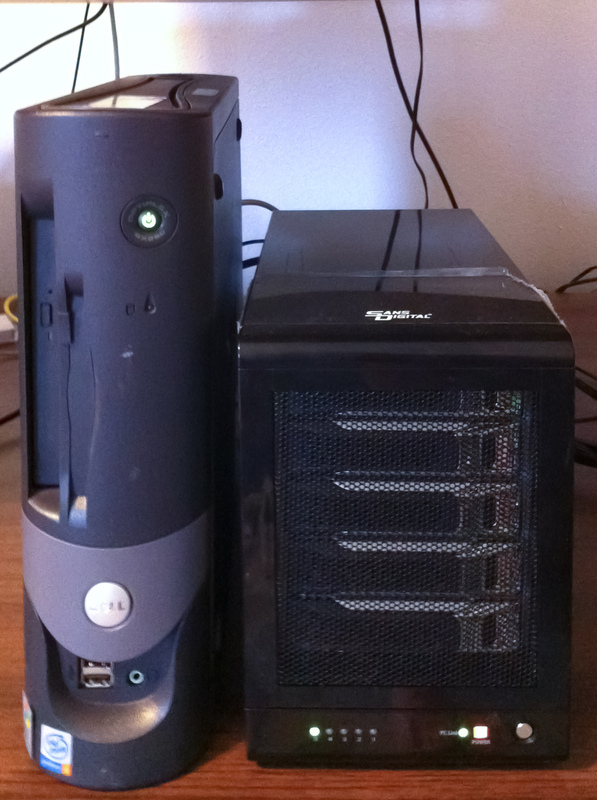 I got myself old Dell GX280 desktop with P4 2.8 GHz processor and 1 GB RAM. It has “relatively” new technology onboard including one PCI Express port in which I was able to insert controller card. As my server is supposed to serve multiple purposes, including driving my hvac system, I quickly dropped the idea of using one of dedicated NAS distributions (FreeNAS namely) and decided to stay with old mighty Ubuntu 10.04LTS. The installation went smooth and within minutes I had the server running. But there was nowhere to find my drive inserted into external enclosure. It turns out that the controller provided by Sans Digital is built on HighPoint Technologies’ 622 chip which itself is not supported by Linux Kernel. Thankfully Sans Digital provides source codes for drivers in both RAID and passthrough versions. I’ve chosen the passthrough version as I plan to skip hardware raid provided by the enclosure and use zfs. [ 260.187351] rr62x: module license ‘Proprietary’ taints kernel. [ 260.196263] rr62x:[0 0 ] start port. [ 260.196263] rr62x:[0 0 ] start port hard reset (probe 1). [ 260.196263] rr62x:[0 1 ] start port. [ 260.196263] rr62x:[0 1 ] start port hard reset (probe 1). [ 263.808262] rr62x:[0 1 ] start port soft reset (probe 1). [ 264.456614] rr62x:[0 1 ] pmp attached: vendor 1095 device 3726. [ 268.104271] rr62x:[0 0 ] failed to hard reset. [ 268.104286] rr62x:[0 0 ] failed to perform port hard reset. [ 269.709009] rr62x:[0 1 4] start device soft reset. [ 270.360323] rr62x:[0 1 ] port started successfully. [ 270.360323] rr62x:[0 1 4] device probed successfully. So far so good. All pieces of hardware accounted for and work well. And we are set for now.